The SAP profile parameters can be configured in RZ10 transaction via profiles and some of the parameters in RZ11 transaction. Only the dynamic SAP parameters can be configured in RZ11 transaction, this will take effective with out system restart. All the static SAP parameters needs system restart to take effective. We can check whether the parameter is dynamic or static in RZ11 transaction by displaying the parameter, if the parameter have change option in RZ11 then we can consider it as dynamic parameter, if no change option then it is static. You can use transaction RZ11 to display properties of profile parameters and to dynamically change the values of profile parameters. The properties of the profile parameter act as the basis for checking the default profiles and instance profiles in the system (transaction RZ10). Parameter Type: Assignment of a profile parameter to a type. For each parameter type, there is a standard check. This check is always executed if there is no separate check function for the parameter. Integer : This is an integral value. You can also specify a maximum and/or a minimum value. Double: This is a floating point number. You can also specify a maximum and/or a minimum value. Boolean: This is a switch with two statuses. Only the following values are permitted. All other values are interpreted as errors. Permitted values: TRUE, FALSE, 0, 1, ON, OFF, YES, NO. The comparison is not case-sensitive. Character String: This is any character string. No check is made. Enumerations: These are enumerations. The parameter can only contain certain values. Parameter type Character String to a fixed number of parameter values that can be chosen. For example, “DIA BTC UPD UP2 SPO ENQ”. Parameter Description: Short description of the parameter. Is always written in English, since this text is not translated. System-Wide Parameter: If the parameter has this property, the value of the parameter is fetched on each server during the check and the system checks whether the values are the same. The value must be the same on all servers. Dynamic Parameter: If the parameter has this property, the value of the parameter can be changed dynamically, that is, during running operation. In this case, a “Change Value” button is automatically displayed in RZ11. If the user chooses the button, a dialog box appears, in which he or she can enter the new value for the parameter. In the dialog box, the user can check the “Switch on All Servers” field. This means that the value is changed on all servers of the system. Changes are recorded both in the syslog as well as in the change history. The change history contains the last 10 changes and is deleted with every restart of the server. In addition to the metadata, rz11 also displays information as to the source of the current parameter value. If the value has been changed manually, the source is displayed as “dynamic switch”, together with a link for calling the change history. In some cases, the current value can deviate from the profile value, although it has not been changed manually. These cases are also viewed as dynamic changes. However, since there is no change history here, the comment “(kernel)” is displayed instead of a link to the change history. One example of a parameter where this effect can occur is rsdb/max_blocking_factor. If the profile value is -1, the parameter value will be changed by the kernel to the default value of the database interface (see SAP Note 1296224). Vector Parameter: If the parameter has this property, the parameter can be set more than once in a vector. Example: icm/server_port can be configured as icm/server_port_0, icm/server_port_1, and so on. Kernel Default: Default value of the parameter, as defined in the SAP kernel. Default Profile: Default value of the parameter, as defined in the default profile DEFAULT.PFL. Instance Profile: Value of the parameter, as defined in the instance profile. 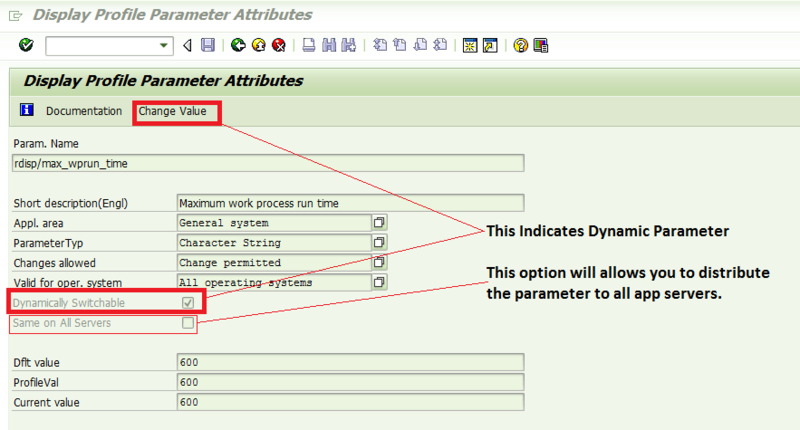 If the parameter is not defined in the instance profile, the default value is used. Current Value: The value of the parameter as it is currently used in the system. Below is the complete list of SAP Profile parameters. You can use the search functionality to get the relevant parameters. Click on the parameter and use right arrow to see the all columns. as4/dbmon/enable ON ON dbmon functionality enabled ? cpuid/trunc_size 0 0 When truncating computer names, number of remaining c.
dbs/db4/dbsl_trace DB2/400: dbsl trace settings. dbs/mss/schema dbo dbo Schema name (or sql server user name). Always SID in lowercase. dbs/syb/schema dbo dbo Schema name (or ASE user name). Usually SAPSR3. dynp/checkskip1screen OFF OFF Activate/Deactivate check start transaction with "skip first screen"
dynpro/global_fields NO NO Enables/disables the usage of global fields. enque/deque_wait_answer 0 0 Dequeue: wait for answer of enqueue server? gw/accept_remote_trace_level 1 1 CPIC and RFC: adopt remote trace level? icf/set_HTTPonly_flag_on_cookies 3 3 Set HTTPonly-Flag for Cookies. icm/HTTPS/verify_client 1 1 SSL Client Certificate required? rdisp/jvm_pool SERVLET=on, RFC=on SERVLET=on, RFC=on pooling of java vms active ? rdisp/reinitialize_code_page 0 0 Reinitialize code page when processing request? rdisp/vb_delete_after_execution 1 1 Delete update requests after execution? rdisp/vb_v2_auto_sync 0 0 Auto sync for V2 update requests? rdisp/vb_v2_start 1 1 Start v2 update requests automatically? rsdb/prefer_in_itab_opt -1 -1 set if IN (...) shall be used for FOR ALL ENTRIES (if possible). sapgui/user_scripting 0 0 Enable or disable user scripting on the frontend. sapgui/user_scripting_force_notification 0 0 Prevent users from disabling the SAP GUI Scripting notifications. sapgui/user_scripting_per_user 0 0 Check user priviledges to determine if user scripting should be enabled. sapgui/user_scripting_set_readonly 0 0 Enable or disable a read-only version of SAP GUI Scripting. snc/data_protection/max 3 3 Limit for data protection of Secure Network Comm. snc/identity/as Name of application server for external Security Syst. transport/tp_logging ON ON Usage of interface to transport program is logged in the database (table TPLOG).